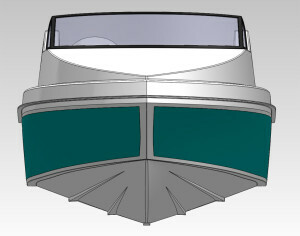 This is a New 5.7m Fibre Glass runabout, due out in March 2012. This boat will be great for the family man that also wants to dive and fish out of it. Being of Fibre Glass, it will give you a nice soft ride, but still have enough stability to sit nicely in the water. The engine is mounted on the pod, that is intergrated into the bottom. I reckon I would add a couple of timber platforms on the back and a stainless steel swim ladder, just to add a bit of bling. This boat has a 125 litre fuel tank mounted under the floor, that will take you a long way on a modern outboard. 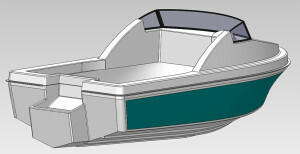 This boat will come as a DYI kit, so if you would like to no a little more about the Fibre Glass DIY concept, please contact DBA and we will send you the details.